That might be of interest to other people because the reasons why I moved to the web and the net, not simply as a distribution or communication channel, but as my primary artistic medium, get at something important in our time beyond the “communications revolution” and the coming of the web and the net. Poetry has always been where our most intense engagements with language play out. Those engagements involve putting things together that haven’t been put together very much previously. The net and the web have a way of putting things together. Ideas. Media. Arts. Fields. Technologies. People. Languages. Codes. Methodologies. And of cross-breeding them, creating the cross-products. Poetry has to be able to be fluent in those sorts of hybridities and syntheses. Because this is just an important part of how any field proceeds. Particularly these days. If you got fried dumplings, then eventually somewhere they died frumplings. We see below in the words of Guillaume Apollinaire from his 1917 essay “L’Esprit Nouveau et les Poetès” that the activity of putting arts and media together has been ongoing for some time in the avant-garde. And, in several senses, putting things together is fundamental to art. That’s what creativity is. Typographical artifices worked out with great audacity have the advantage of bringing to life a visual lyricism which was almost unknown before our age. These artifices can still go much further and achieve the synthesis of the arts, of music, painting, and literature … One should not be astonished if, with only the means they have now at their disposal, they set themselves to preparing this new art (vaster than the plain art of words) in which, like conductors of an orchestra of unbelievable scope they will have at their disposal the entire world, its noises and its appearances, the thought and language of man, song, dance, all the arts and all the artifices, still more mirages than Morgane could summon up on the hill of Gibel, with which to compose the visible and unfolded book of the future. This ongoing project of synthesis, of putting things together, reaches a critical point with the advent of computers. Because everything in computers is represented by zeros and ones. Everything digital shares this common language of representation. So putting different things together is, superficially, just a matter of putting similar things together: zeros and ones. Of course it’s a little more complex if the synthesis is to be meaningful, but we see that the synthesis of arts and media reaches a crucial stage with the advent of the computer because the boundaries of representation between media are dissolved—which is also true of the representation of electronic media more generally, as magnetic patterns on tape—texts, images, and sounds are all represented as inscriptions on tape—but, they’re not programmable. The tape of a Turing machine, a computer, is read by a machine that can react conditionally to what is on the tape. Whereas non-programmable electronic media are simply read and processed unconditionally, and the tape, in non-programmable machines, is read linearly, from start to finish, rather than being able to have the head effectively jump around on the tape and create new stuff or delete old stuff on the tape based on what it’s read. In short, this difference between the way media are represented in electronic non-programmable machines and programmable machines is like the difference between the way things are recorded in normal media and the way they’re recorded in the brain. The brain is obviously capable of extraordinary synthesis of arts and media because of the conditional nature of the way we read, write, and process stuff in the brain. Synthesis is not simply about slapping things together but working also at a semantic level of cross-reference. The lettrist poet Isidore Isou, before computers became popular, said “Each poet will integrate everything into Everything.” Which, of course, is a little more ambitious than the synthesis of arts and media. If the computer facilitates the synthesis/integration of different arts and media, the creation of networks of computers connects people and their ideas and resources in dramatic ways. “Connectionism” is usually understood as “a set of approaches in the fields of artificial intelligence, cognitive psychology, cognitive science, neuroscience and philosophy of mind, that models mental or behavioral phenomena as the emergent processes of interconnected networks of simple units” (from Wikipedia). But ‘connectionism’ could also refer to an aesthetic or philosophy that stresses the value of putting things together, of making connections between things, especially things that haven’t been connected previously and things that, when connected, connect many things or relate many things by associativity (a is related to b, b is related to c, so a is related to c). I didn’t have this sort of perspective on computing and the net at first. It’s taken a while. But, as a poet and a programmer, I’ve been interested in the consequences of computation on language and poetry for a long time. Also, even before the web came along, I was dissatisfied with the notion of publishing to the little magazines and publishing books of poetry (as we typically know them) but felt I was working as a poet. I began my odd career as a media poet producing a literary radio show for eight years in the 1980s and early ’90s; producing the radio show was my introduction to working creatively with electronic technology: mixing boards, four-track analog reel-to-reels, cassette decks, microphones, the occasional effects unit and, most of all, razor blades and tape. I’m also involved in visual art on the computer in visual poetry and work such as http://vispo.com/dbcinema . Also, I couldn’t operate at the local level because the more interesting audience and action, in media poetry, is elsewhere. And I wanted to explore poetry at an international level, a cross-cultural level. My best poetry is hardly even recognizable as poetry. It can’t be published on paper, being interactive and kinetic, often interactively sonic, and so on. But the engagement with language is intense. That, to me, is the thing about poetry: the intensity of the engagement with language. Because our engagements with language have changed so much, have broadened to include so many different types of language and code, the “field” of poetry is now acquiring the sort of broadness associated with the visual arts, which is beyond any particular medium or paradigm concerning the object of art apart from it needing some visuality, probably. The spirit of poetry animates and, sometimes, directs or dominates some projects in holography, genetics, mathematics, film, interactive media, sculpture, audio, and many other fields, arts, and media. Moreover, the intensities of language associated with some of these projects are often far from what is normally recognizable as poetic language. They might deeply explore genetic codes or computer codes or interactive codes or visual language or take any number of other approaches to language. Why call it poetry, you ask? Well, poetry has to be on the move or it risks being simply a retreat to simpler times, a retreat to simpler understandings of language than we puzzle through these days. Poetry has to go where our engagements with language are most intense. In any case, you can see why I gravitated to the web as medium. It supports a variety of programming languages. It supports multimedia and/or intermedia, including audio, visuals, interactivity, text, and video. And you can publish to an international audience if you know how. Also, there are a few other people around the world doing related work to talk with on the net. And many others doing all sorts of interesting things. The web was beckoning as artistic medium, as a distribution channel for my work and as a communications channel with other artists. The net/web is a phenomenon where many connections can be made between fields, arts, media, and people. Also, it offers artistic possibilities that are relatively unexplored. The way the web changes over time—because of the ongoing development of new technologies and, eventually, artistic understanding and use of those technologies—makes for a situation where the possibilities are replenished periodically. In other words, from time to time, new technologies are added to the web that are analogous to, say, television being (optionally) added to the pages of books or adding brain information filters/processors. All of a sudden you have strange new possibilities. And this sort of innovation is going to keep happening because of the nature of computers as universal machines. It is very likely—although computers of course will continue to get faster and hold more memory and the software will improve—that the theoretical computer—the notion of the Turing machine—will not ever be eclipsed as a computing device. It is also highly likely that we will never discover thought processes of which humans are capable and computers are not. Which is to say that computers are, very likely—at least in theory—capable of thought itself. That is how flexible computers are, as machines. It’s likely that there is simply no conceivably more flexible a machine. A machine that is as flexible as thought itself is as flexible as it gets. But, to return to my own more humble practice, the prospect of creating a web site as one’s main work appeals to me. This is the largest and perhaps main artistic form the web has generated. A site of one’s work is not one or two even a half dozen works but the work of many years. Walt Whitman wrote one book, Leaves of Grass, and worked on it over the course of his life. Vispo.com is my one “book”. I’d been inspired by the work of Joseph F. Keppler, a polyartist friend of mine from Seattle whom I met in 1988. He too had issues with the book as being different from the sort of work he was pursuing, which often required special cutting of paper, folding, assembly, or audio tapes or posters or readings/events or other basically non-bookish elements. Some of his work is also sculptural or photographic or performative. Not much of it works naturally in book form though he has, additionally, written several manuscripts. Joe’s work and his questioning of form and content in poetry helped me a great deal to understand some of the possibilities of polypoetry. Joe and I also shared an interest in the work of people such as Henri Chopin, Richard Kostelanetz, Jenny Holzer, bpNichol, and other media poets. One of the problems we had with the book was the simple non-bookness of our work. At that point in the late ’80s, my own work was simply the radio show and a couple of manuscripts of poetry. Joe’s work was far more advanced in many forms and directions. I had, for instance, a couple of baggies of poems by Joe, Trudy Mercer, and others in the Seattle scene done as matchbooks, postcards, origami-like constructions, and other assorted constructions that just don’t fit in a book. As I moved into learning how to use a computer, how to program, and how to create a web site, by 1996, the form of the web site posed compelling possibilities for containing multimedia work of various types, programmed work, and so on. A new container of forms and content as an intermedia analog to the book. An artistic site and the works in it can operate at levels and types of literacy that we rarely experience. 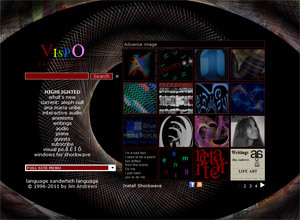 Vispo.com does demand both literary and computer literacy–or an open mind, and it suggests that computer literacy is by no means irrelevant to contemporary literary literacy. Another reason for my gravitating to the web concerns my background in literature, math, and computer science, which gives me a particularly Pythagorean view of the impact of computation on art and language. The theory of computation is a fascinating mathematical theory concerning the capabilities and limitations of computing machines. As I said earlier, there probably can be no more flexible a machine than a computer. Programmability provides machines with the atomic level of thought; software and the emergent do the rest. Computers are profoundly flexible machines, even if contemporary ones usually aren’t so fascinating. Thought itself as art, for instance. Executable/program as artifact of active or sometimes interactive thought/thinking. Computers, properly understood, are not simply glorified media devices. They’re not simply glorified televisions or typewriters. They are, theoretically, capable of anything any conceivable machine is capable of. And we need to broaden our notions of what machines are capable of to include whatever beings are capable of. So the vistas of digital art, and the impact of digital art on language, art, and life, are bound to be startling and dramatic. These vistas centrally involve questions of who and what we are. Not only because those have always been crucial to art but because of the dramatic and startling nature of the humanity/machine issue. Relatedly, the question of what poetry is and can be in the digital age arises. As computer hardware and software give us new capabilities—and they do give us new capabilities because, remember, as McLuhan pointed out, technologies are extensions of our bodies or our cognitive abilities—we have to learn to feel with these new abilities. If we can’t feel with them, they are numb metal claws and we will probably be less than fully human in our exercise of these new abilities. The vistas of digital art are only as wide as our poetential to grasp the possibilities with full human expressiveness. In this sense, good net art is important to our ability to operate as fully human beings in this age of ongoing, diverse net activity. So that’s more or less why I chose the web as my main artistic medium. The circumstances and path of my life has led me to it. And I’ve had a sense that, in making the work I have, I’ve been involved in a new type of writing and art that will be more common as time goes on, as our activities with computers and networks become more ubiquitous and diverse. And that the sort of work I’ve been doing might be useful to spur imaginative acclimatization to computing environments and their possibilities and world views. This essay is also published in The Journal of Electronic Publishing. Jim, this is a brilliant exposition of your passion for net art, which is something quite distinct from computer art. The web is the perfect medium for your highly unusual array of talents, that are all “languages” in the broadest sense. The web also supports and inhabits the sort of “mobility” (kinesis/poesis) that is so central to your being-in-the-world. I remain skeptical of any sort of “singularity” re the convergence of the human and the machine, yet your work does not make such grandiose projections, being full of humor and humility, that is also part of who you are. Either our future learns to acknowledge and celebrate the power and beauty of such qualities, or we are toast! Concerning the issue of humanity and machine, I think there is much work to be done toward understanding. In some ways (though not in others) the situation resembles the social attitudes that surrounded Darwin’s ideas around 1860. There was much consternation and general feeling that to assent to Darwin’s idea that all life on Earth ascends from common ancestors would be to diminish our ideas of what it means to be human. Even those who thought that Genesis was probably not the best source for knowledge of our true origins may have felt objections to being ‘lumped in with green slime’. Now, however, we see that the vision of our history–and the history of all living things–that Darwin’s ideas *implies* is really quite rich and, oh yes, certainly, even beautiful. Very much so. Darwin’s ideas have millions of consequences. And, incidentally, we call them “Darwin’s ideas”–and so they were–but they were not only his. For instance, his grandfather Erasmus was a poet and naturalist who wrote about evolution. These were ideas whose time had arrived, particularly given related ideas in geology and archeology of the time on fossils and the age of the earth. Somewhat similarly, there’s the idea that our bodies are biological machines and that the brain must, perforce, be a machine of some sort–an information processing machine–well, I don’t see what the alternative to this is, really. We think of machines as being like toasters and fridges and contemporary computers and, quite rightly, feel that to liken our own cognitive capabilities to what these things are capable of is way off the mark of who and what we are. But the brilliance of Turing and Church (Mr Church) in their formulation of ‘the universal machine’ was to devise an abstract machine, a mathematization of the contemporary computer–which we now call the Turing machine–which, even after sixty years of progress, still stands as *the* theoretical model concerning computers and their capabilities/limitations. There is no proof, and probably never will be, that there exist thought processes of which humans are capable and computers are not. Which is to say that it’s altogether likely that our current theoretical understanding of what a machine is is sufficient to produce thought. Perhaps ‘thought’ that is quite different from human thought. After all, we have bodies and families and social relations and emotions, drives, instincts, and so on that greatly condition our existence and our thoughts. And our language. All those are not required for ‘thought’ but may well be required for ‘human thought’. In any case, to make a long story short, I think that just as Darwin’s ideas took a lot of heat, in his day, that they don’t get anymore, for the most part, will in many years be likened to the situation now concerning our views of machine intelligence. But we note that the reason Darwin’s ideas don’t get that sort of heat anymore has to do with the profoundly explanatory nature of Darwin’s thesis and the way its consequences have been teased out in hundreds or thousands or perhaps millions of ways since then, and, really, the *beauty* of the resulting vision of the relatedness of all living things on the planet. We haven’t seen the consequences of the idea that we are machines being realized with the same utility and beauty. Yet. Concerning the ‘singularity’, well, at this point it resembles an industry. I’m not really part of that industry. Thanks again, Gregory, for your kind remarks. I’m very happy that you read it and enjoyed the essay, my friend.